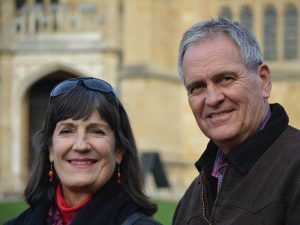 Dave and Barbara Miller work through the Laussane Church Planting Network and the 220 Challenge to encourage church planting and disciple multiplication across the Churches of God and other evangelical churches in Latin America. They are also working to raise up a new generation of leaders through organizing and planning the International Forum and other regional events for the Church of God. The Millers first went to South America with the Missionary Board of the Church of God in 1980, the same year that they were married. After a year of language study in Costa Rica, they moved on to Bolivia, where they stayed and ministered for the next twenty-one years, during which the Bolivian church expanded at a steady pace from eighty-two churches to more than two hundred local congregations. In 2004, they returned to serve as Global Strategy regional coordinators for Latin America, stepping out of that role in 2015 to pursue church planting full time across the region. Dave's family first began attending the Church of God in Akron, Indiana, when he was seven years old. But it was while attending camp meeting in Anderson that he accepted Jesus Christ at the age of sixteen. He recalls, "I was sitting on stage in the third row of the choir, and at the invitation, I felt conviction. I started praying for everybody else I know who was unsaved when God spoke clearly to me, saying, 'It's find to want forgiveness for other sinners, but what about you?' I trusted him in that moment." The call to missions came later, during Dave's first semester at Asbury Theological Seminary in Kentucky. "A speaker shared that 94 percent of trained Christian workers serve the English-speaking world, which represents only 7 percent of the world's population. I said to myself, "That's terrible; somebody ought to do something about it. God heard me and for the second time in my life I heard his voice, saying, 'Okay, Dave, you're somebody. What are you going to do about it?" Barbara also grew up in a Christian home. She spent her early years in the Belgian Congo and Zimbabwe as the daughter of United Methodist missionaries. She came to know Christ at the age of twelve while attending a United Methodist youth camp in Lake Webster, Indiana. Of her call to missions, she says, "From an early age, I felt the call to be involved in cross-cultural ministry. This was confirmed in 1974 when I attended the Urbana Missions Conference at the University of Illinois."